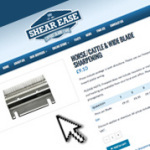 Clipper Blade Sharpening Specialists - Shear Ease Ltd. If paying by cheque, go to step 2. If paying by card visit our online shop and order from our services or products. Whether paying by cheque, card or cash, visit our online store here and order from our services or products. Ordering via the store enables us to log your order details more efficiently. It also provides both parties with a unique order number so we can keep a track of your order, process it as quickly as possible and notify you when your blades have been sharpened and despatched. If ordering blade sharpening, scissor sharpening or clipper servicing, follow steps 2-4 below. If ordering products step 1 is all you need. Your products will now be sent to you. If sending in blades or scissors for sharpening print this. If sending in a clipper print this. Take note of the order number you generated in step 1. No order number needed if paying by cheque. If ordering clipper blade or scissor sharpening print our our freepost label. If ordering clipper servicing print out our clipper servicing and repair label. Fill the form in, making sure to include all the required details. The order number is the number generated once payment has been made, straight away on our website and also in an email confirmation. Package up your blades or scissors and securely fasten to a piece of cardboard and place in a suitable envelope. Clipper should be packed in a box so no damage can be done during transit. Try to keep clipper blades as flat as possible. Doing so helps us keep our costs low and it dramatically reduces the risk of breakages while they’re in the postal system. 1. Secure blades onto a piece of stiff cardboard, an old cereal box is ideal. 2. Make sure the cardboard fits snug into a padded envelope. 3. Secure the address section to the front of your envelope. 4. If sending clippers wrap your clippers in bubble wrap and put them in a box packed with suitable packing material. 5. Follow the instructions on the postage labels. Enclose the correct slips inside your package along with your blades, scissors or clipper. If paying by cheque, enclose the cheque instead. Please write your name, the first line of your address and postcode on the back of the cheque. 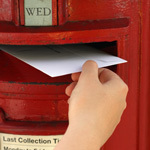 Post your envelope by putting it in the red box, handing it your postal worker or over the counter at a Post Office. 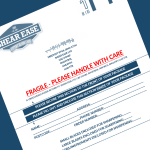 Our Freepost label ensures you will not need to pay and should be used to send clipper blades and scissors to us. It does no include insurance or tracking. If you need either of these they can be arranged at your local post office. Assuming your blades arrive here between Monday and Friday they will be sharpened and sent back the same day they arrive. If your blades arrive on Saturday they will be sharpened and sent back on Monday. Notable exclusions are public holidays and Christmas time. Our website will be updated around Christmas so please check then for holiday times. 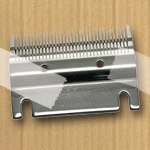 You will need to pay for clippers to be sent to us to avoid an additional postage charge from us. They can be sent by courier or royal mail. Our postage label will work for both.